The diagnosis is that there has been change in the news business. And the issues to the NYT are all on the reader side. The word ‘advertising’ is mentioned just 10 times in the entire 100 page report and ‘advertisers’ just two. That should give the advertisers some pause. It should also give we economists some pause. We keep analysing news media as a two-sided market yet the news media themselves keep on thinking about one side — the readers. Could it be true that they don’t care? Or is it that readers come first and advertising dollars will flow later? If so, where did all the advertising revenues to news media go in the last decade and a half? When I looked at that data, I thought it was advertising that was being disrupted although as I have noted before some prominent people have disagreed. One of these days someone will explain to me why advertising isn’t part of digital strategy for news media. In any case, the interesting nature of the report is how it is thinking about readers. It notes its competitors. And the competitors the NYT is worried is not the Washington Post, CNN or the Wall Street Journal. They have looked at the numbers and are worried about Buzzfeed, ESPN and Vox amongst others that haven’t even launched. And why are they worried about those others: because they are doing things very differently. The diagnosis is very simple: the NYT is organised for print and that makes no sense at all. Even where they have innovated in the digital space it is still within the confines of an organisation that separates the newsroom from other functions. All their competitors are organised differently. Within the NYT even if they could talk to one another, it is not clear they would be able to. And how do they propose to handle this? They intend to break down some walls and blur some lines. This is the logical path from a diagnosis of organisational issues but it is hard to imagine how this will be achieved. They are going to need some incredible people and leaders to achieve this. But when those people have flocked to start-ups because they are done with organisational politics, one is left wondering whether there is any hope here at all. There will certainly be years of eye-rolling on the inside. When I read this report, the sense I get is that the problem is the notion of an organisational chart. They want to redraw it. That means adhering to a planned solution. Someone must assess a change and make it. The NYT seems too large and too diverse a potentially creative organisation to work that way. But what if things were different? The newsroom is still an anchor. It has people with expertise and experience (including judgment as to what is publishable) and it has editors that can ensure that material is of a high quality. But the newsroom also controls what goes out and with what prominence to the outside world. Given that Page One or the Home Page of the NYT has been devalued, the core message here is what is prominent has been devalued. In other words, the public has moved on from how the NYT traditionally organised what got put in front of us. 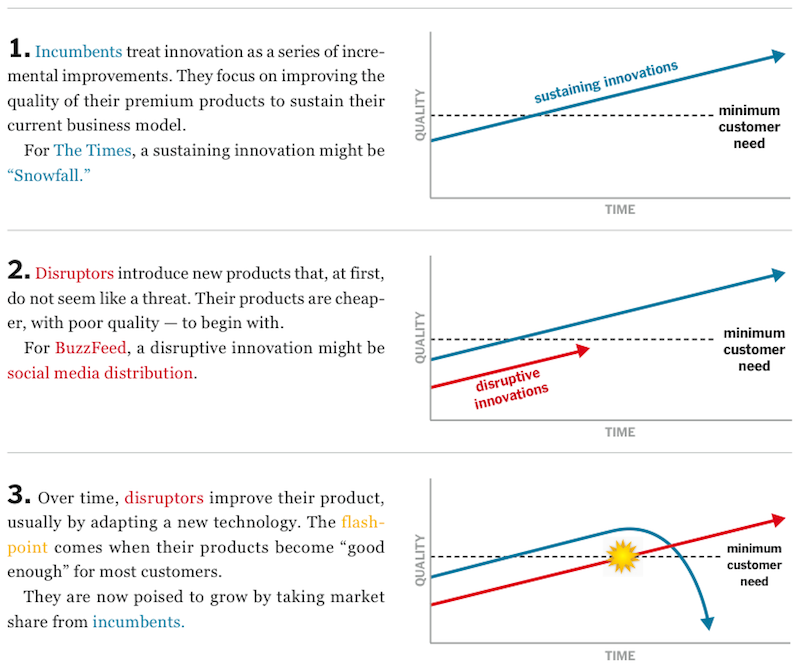 My guess is that the NYT needs to take the prominence part of the newsroom out of the newsroom and create multiple platforms with different missions and experiments as to how that content gets brought to consumers. One will be the traditional print newspaper (and its web counterpart) but that will sit outside the newsroom. Journalists will supply content but it is others who will decide where it should go. But there will others as well. Apps, social media, licensed content to other sites etc. Each would have its own ‘editorial’ team that basically took from the newsroom and packaged it however they wanted to in order to bring readers in. After a while, each of these platforms will cycle back to the newsroom with their views of what works and what does not and perhaps, just perhaps, other innovation will occur. What I think other news organisations have got right is that they do not manage what goes to the public assuming that (a) the public is giving them a ton of attention and (b) that attention is limited by print constraints. That has led to a more fluid interface and a stronger market for ideas. The question is: does the NYT want to insist on a single voice in the market place or allow itself to have many voices? Next PostNext Is Netflix's place in the slow lane?